The Founders believed that the people would be constrained by the requirements of virtue and a fear of shame. When the pimp and his surprise arrive, Mr. Blow and his rat pack of friends are eagerly waiting. He tells the front desk at his building to send his guests up right away. The doorbell rings, Mr. Blow opens the door, and the pimp is standing there with a beautiful woman. What’s the point of this hypothetical? Well, it’s partly a veiled Troy McClure reference, but that’s not important right now. The main point here is that — going by these facts alone — we can conclude a couple of things: Mr. Blow wanted the pimp to bring some sort of aquatic paramour — and I don’t mean of the Shape of Water variety. Second, we know that he was disappointed when he was presented with something other than one of Poseidon’s scaly daughters. The reason I bring this up is to illustrate a simple fact. Whatever happens with the Mueller investigation, whether or not there’s any evidence — or additional evidence, depending on your point of view — that the Trump campaign truly “colluded” with the Russians in the 2016 elections, we already know that the campaign wanted to collude with the Russians. The now-infamous meeting with a Russian emissary at Trump Tower — attended by three of the most senior members of the Trump campaign, chairman Paul Manafort, Donald Trump Jr., and Jared Kushner — was supposed to be about colluding with the Russians. Rob Goldstone, a Trump crony working as an intermediary, had promised Don Jr. that the Russians had dirt on Hillary Clinton. When the Russian agent started talking about adoption — code for Russia’s unhappiness with Magnitsky Act sanctions — the Trump crew was disappointed. Now, none of this proves there was any subsequent meaningful collusion. Nor is there direct proof that Donald Trump was in on this meeting, though commonsense and some circumstantial evidence suggests he was briefed either before or after. And it’s been reported that Donald Trump Jr. also met with some Arab princes who offered to help Trump win the election. I don’t want to belabor the point, but the simple fact is that from what we know, the Trump campaign intended, wanted, sought, and desired to work with foreign powers — some allied, some clearly not — to win the 2016 election. Stupidity and the desire to prove himself are possible excuses for Trump Jr. After all, Fredo didn’t really plan to betray Michael, he just wanted to show that he was smart and that he deserved respect. But Paul Manafort certainly can’t use the Fredo excuse — he’s made millions as a willing agent of Russian interests. The jury is out on Kushner. The only reason I bring this up is that for many people — with the president at the top of the list — the mere suggestion that the Trump campaign would ever think of colluding with Russia is simultaneously a grave slander and an absurd conspiracy theory. It may not be true, but it’s neither absurd nor a slander. Going by the hypothetical at the beginning of this “news”letter, there’s no direct evidence to support the claim that Joe Blow & Co. actually diddled mackerel. But it is neither a slander nor absurd to say that Joe Blow & Co. wanted to get jiggy with a flounder or that they’re the types of people who are perfectly capable of getting their freak on with fish. The Constitution is a bit like the blueprint for a hedge maze. It lays out on paper the paths for the travelers who trod through it. But the Constitution itself is not a hedge. Those plants grow from the ground up, rooted in the soil. The blueprint “works” because the hedges do their part. But what if the hedges start to die from lack of care? When big holes in the green walls appear, shortcuts will become all the more tempting. And when the hedges disappear altogether, people will start walking as the crow flies, taking the shortest route to their desired destination. The Founders made any number of assumptions about the country that they were imposing their Constitution upon. Among the most significant, however, was that the people themselves were constrained by the requirements of virtue, a fear of shame, and the belief that the fear of an all-knowing, all-seeing God would help regulate the society. These were the hedges of the new garden of liberty that the Founders were constructing. America has always had political scandals, and it always will because all scandals derive from human nature and human nature isn’t going anywhere. Basically, there are only two ways to avoid scandal. The first is not to do anything wrong in the first place — to let virtue, probity, and fear of shame keep you from indulging your baser instincts. The second is to keep your wrongdoing secret. Again, you cannot legislate away the propensity for scandalous behavior — if men were angels and all that. But you can regulate them by ensuring that the people — both the wrongdoers themselves and the people themselves — maintain their ability to be outraged, offended, or, in the case of transgressors, ashamed when the truth comes to light. John F. Kennedy behaved scandalously with women, but the press and his court kept it all a secret on the reasonable assumption that if the public found out, it would destroy Kennedy’s presidency. What this says about the press corps back then is the subject for a different seminar. But it seems likely to me that if the news had gotten out, the country and the political class would have turned on JFK. Likewise, I suspect Kennedy himself would have concluded, like John Profumo, that he had no choice but to resign. Bill Clinton went another way. Being president was more important to him than his party or his country, and he vowed to stay put to the bitter end. Richard Nixon boasted often that he was not a quitter, but by the end he understood that he had no choice but to leave office — to spare himself, his party, and the country the ordeal of impeachment. Nixon lacked the shame to avoid traipsing as the crow flies, but he had enough to do what was right when the secret was out. And the leaders of his party had their share as well. Even after the Clintons left office, they still believed the hedges were for the little people. As Josh Barro notes in an excellent column, one of the reasons the scandalous nature of Donald Trump’s pay-for-play administration hasn’t gotten more traction is that the Clintons had normalized so much of that kind of thing. I’m not playing whataboutism here or even heaping the blame for today’s scandals on the precedents set by Democrats. I think it’s all bad. Rather, my point is that the hedges are drying up all around us. We hear so much about Making America Great Again and what, exactly, that is supposed to mean. But it seems lost on the people who shout the phrase most loudly and sincerely — and even wear it on their heads — that back when America was great in their eyes, Americans would have pelted a president from public office for bedding Stormy Daniels or running a campaign filled with crooks, grifters, and would-be collaborators with foreign powers. Likewise, back when America was great, the Founders’ assumption that members of Congress would be interested in investigating malfeasance, skullduggery, and incompetence in the executive, regardless of which party controlled either branch of government, was still operational. Back when America was great, our leading intellectuals would not feel the need to explain why a bad man can be a good president. They might be right in their argument, but that they feel the argument needs to be made is a profound concession — one that would be unimaginable even a few years ago. To be sure, back in the Arcadia of American Greatness, football players stood for the National Anthem. But they also didn’t need to be forced to do so. With the flesh and sinew of civil society shorn from the skeleton of the body politic, culture-war victories now come with the sound of bone grating against bone. People cheer the restoration of greatness for its utility as a political “win” but fail to recognize that such wins are a sign of a much greater loss. After the weekend, I leave for Alaska for the funeral of my amazing father-in-law. I don’t have the required energy or time to write anything remotely deserving of him here. I just don’t have the words right now. But I will try, soon. He was a larger-than-life person and one of the most impressive — and intimidating — people I have ever known. I’m still trying to get my bearings about him being gone. Canine Update: All is well here. They were both very happy to see me this morning. Zoë is finally playful again. And curious! Pippa is not a great writers’ assistant. I just don’t have too many stories to share because of all the chaos around here. They do love the warm weather but cope with it in different ways, including maybe hatching a plan to go get frozen yogurt. Meanwhile, the murderous cat has an untroubled heart. Oh, and here’s my father-in-law with Kipper, doing what Pippa was meant to do. I’ll be on Fox News Sunday this, uh, Sunday. 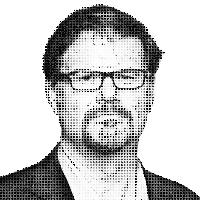 You can go to JonahGoldberg.com for other upcoming appearances and the like. How Cap’n Crunch led to Apple Inc.
Is this the perfect video?